When you are an amateur who just steps into the world of two way radio communications, there is a high chance that you mix up with these two radios – Ham and CB. You might have thought many times which one to choose for you. Although both these are essentially two way radios used under personal control, there are quite a few features that differentiate them. If I’m asked to select one among the two, I would choose CB. Yeah, I’m a Citizen Band radio fan since last 15 odd years and I love using them. If you were asking the same question to my friend John, he will never agree with me. He is with HAM. In conclusion, what I wanted to tell you is that the choice completely depends on your requirement and how you want your radio parameters to be. Ham radio requires licensing, CB doesn’t: CB Radio doesn’t need any licensing. On the other hand, licensing is required to transmit a Ham radio. You will have to appear for tests conducted by FCC and you’ll be given license for using the radio. There was a time CB too required licensing. But later it was stopped by FCC itself. In some countries, CB equipment needs to be approved by the authority. 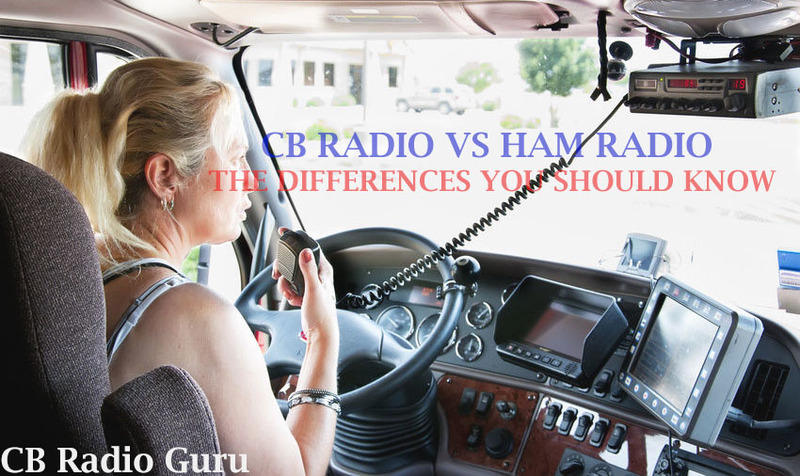 Multiple Band of Ham vs Single Band of CB : Ham radio has multiple bands available whereas CB has single band. Roughly there are 20 plus bands available for CB Radios. Difference in Usage : A CB Radio is best used for local communication. You can buy one as a hobby or to get details on weather report while driving. It will be fun to listen to a CB while stuck in traffic. Ham Radio, which offers better range than CB, is best used for long range communications. Channels: There are no channels in Ham, but frequency ranges. A user has to stay in those ranges. A CB radio has 40 different channels (120 if you count SSB CB Radios). Different Modulation Techniques: A CB uses modulation like AM and SSB whereas HAM Radios work in multiple modulations. They have the privilege to use AM ,SSB , FM and RTTY. Power: Power of a CB radio is limited to 4 Watts in case of AM and 12 Watt for SSB modulation. Amateur radios use 1.5K Watt power. Range: As given above, the range of CB radios are very less compared to HAM radio due to less power consumption. But with little tweaks and modulation here and there, there are many CB users using them for long range communications. If you look closely, it’s the band and licensing that makes a huge difference in the utility of these two way radios. Since there are no channels in those multiple bands of Ham radio, you have the freedom to use the whole frequency range. But in case of CB, your usage is limited to a particular channel you’re using. It’s your choice to select a device with lesser rules and regulations or to get one which gives long range communication. You can have a look at CB Radio Guru’s top 7 CB Radios here. Is it possible to communicate with a CB radio using a HAM radio? Although CB Radios and HAM Radios are essentially two way radios, there’s no connection between them. It is not possible to communicate with a CB radio using a HAM radio. You need to fix #2. to ‘ there are roughly 20 bands available for Ham radio use.